Jessica has not yet aged out of trick or treating with her auntourage. I have to say I am surprised that we have not yet become embarrassing, I would have thought that once the double digits raised their ugly head that our auntourage days would be numbered in single digits, but as always, Jessica surprised me. She has yet to turn into a surly teenager. Maybe she will skip those unlovely phases and segue straight into lovely young womanhood. So far, so good. Megan and I met up with Erica, Julie, and Darius at the Gro, where the new owners have apparently taken over. Erica was delighted to learn that they are Punjabi and that we can expect Punjabi delicacies in the near future. Jessica and her BFF Bella were decanted into Megan’s car, while their elegantly costumed parents returned to the Hagmobile from whence they came to go and have a civilized dinner together. 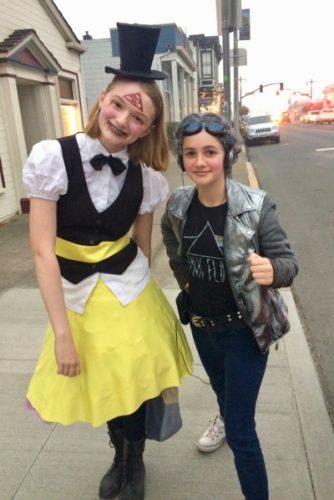 Jessica (left) is Bill Cipher from the TV show Gravity Falls. In my defense, I have never seen it, it’s a Disney show, and on researching the matter later I discovered that he is essentially a villainous yellow triangle with a penchant for top hats. Bella (right) is Quicksilver, apparently an X Men or something. Jessica may not have aged out of Halloween, but her auntourage has aged out of understanding the costumes. We headed to the haunted house first. Bella and I decided that it was too scary for us (perhaps it is not a coincidence that Bella and I also find everything to be too spicy for us) and waited outside for the intrepid Megan and Jessica. The haunted house has both security staff outside and actors who scare the waiting hordes. Since we were early, there was no line to speak of and one of the security guards made the mistake of telling Bella that her goggles were steampunk instead of New Wave, rashly opining that Bella did not know the difference. She was in the midst of setting the misguided security guard straight when the scarer attempted to scare her. Without even looking at him, she said, “Go away, I’m talking” in such an authoritative tone that he did. He didn’t give up on the scaring attempts, but Bella ended up scaring him by suddenly looming up from behind a pillar, making him jump a mile. He sheepishly admitted that she had gotten him and gave up after that. Our brave adventurers enjoyed the haunted house, and we all piled into Megan’s car to start the trick or treating portion of the evening. 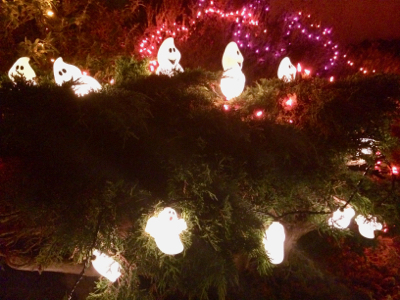 Megan and I had asked around for the best trick or treating locales in the Big Town, and armed with that knowledge, we set out for the most desirable areas first. 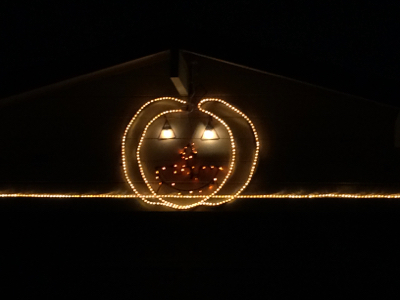 One of the houses had their own little haunted house to go through to get the candy. When the girls emerged, I asked them if it was scary. Jessica said that the owners had clearly seen “It”, and that there were clowns. I asked, “What could be scarier than clowns?” and Bella replied matter-of-factly, “Crippling debt,” before scampering off to get more candy. She is 12, right? This town being as small as it is, we naturally came across Jonathan and Rio handing out candy. I think we were more surprised than they were! Eventually the bags got so heavy that the girls began to complain about toting their weight around the darkened streets, so we headed back to the Village to return our charges to their rightful owners. A good time was had by all. A YEAR AGO: a trip to the South Coast to see a play and pick up a few delicacies. FIVE YEARS AGO: Trick or treating with Jessica when she was truly a kidlet. Never too old to go trick and treating, love the costumes the girls have on, it’s a fun time for them and they should enjoy every moment, which apparently they did. Good on Bella for handling the security guard lol, these girls know how to have fun and apparently so polite in theirs manners, they could not handle the weight of their bag, again lol, good on them.